What a fabulously fun last week and half! I was in Las Vegas for the Food Allergy Bloggers Conference (#FABlogCon) until Monday. It was such a great experience - filled with laughter, tears, education, and surrounded by inspiring advocates within the gluten free & food allergy community. I'll be sharing more from this year's conference in the next week or two, but you can read my recap from last year if you want to know more about it. Just because this Mama is gone, Little Miss still has to eat! Here's a round-up of our latest lunch posts we've been sharing on Facebook and Instagram. Make sure you're following us there too! I cut the dog in half on an Udi's gluten, dairy, soy, & nut free bun. 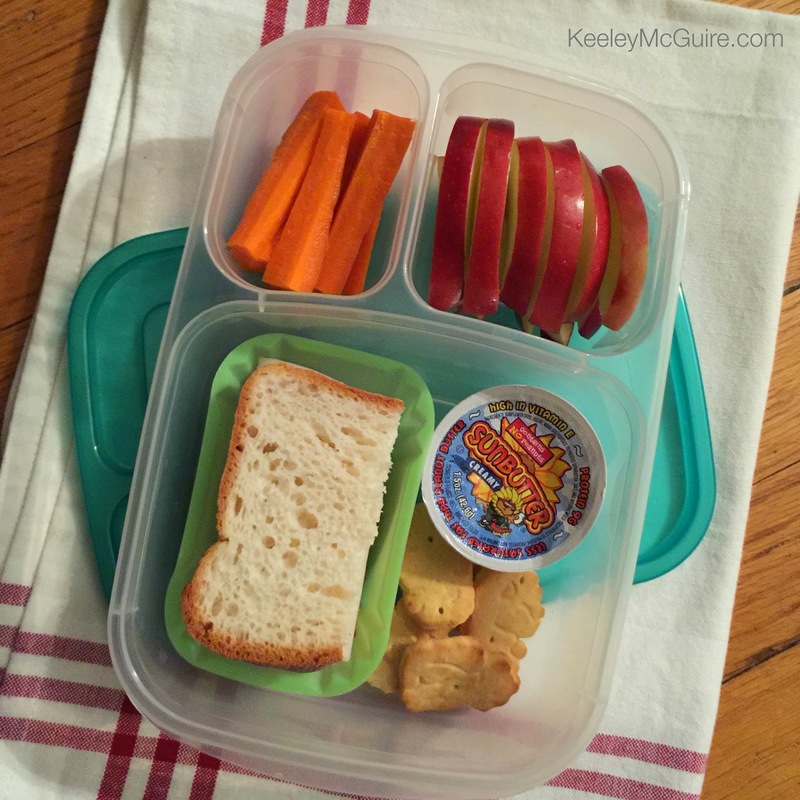 Also packed are potato & broccoli bites, apple slices, carrot sticks, and a Mini Dipper with ketchup in an EasyLunchboxes container. While we're on the theme of simple ;) when we got back from the conference, I was able to include some of the goodies in her lunch. I gave her carrot sticks and apple slices + a cup of SunButter for dipping (you can buy these little cups on PeanutFreePlanet.com). Also packed is half a turkey sandwich on Udi's gluten, nut, soy, & dairy free bread. The little cookies are Ian's Natural Foods gluten & nut free Animal Cookies. When I first asked her if she wanted me to pack some, she hesitated... "Do I like those?" It's been so many years since she's had animal cookies/crackers she couldn't remember! It's moments like that I get a little sad inside, but am so grateful as more & more companies strive to give our food allergy kiddos food like their friends enjoy daily. She tried one before packing and of course loved them! 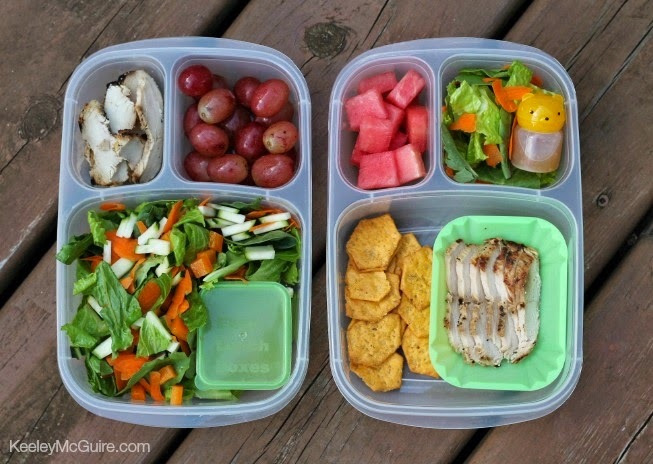 I love cooking up a bunch of chicken breast for supper and using leftovers in lunches for the week. 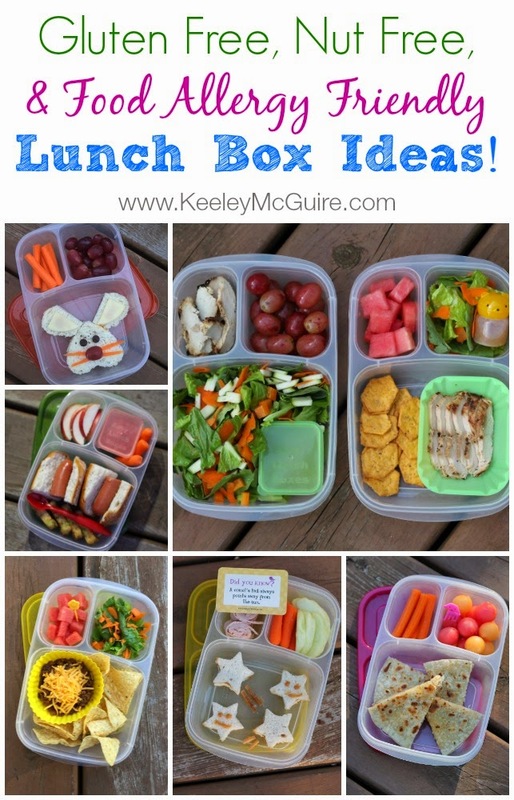 Here I used the leftover chicken in similar ways for our "Mommy & Me" Work & School Lunches in EasyLunchboxes containers. I had a salad with carrot, sweet peppers, and zucchini + chicken breast slices and grapes. Little Miss had Van's gluten & nut free Say Cheese! crackers, chicken breast slices, watermelon dices, and a side salad with carrots. We also put the leftover chicken breast to use in a gluten free Quesadilla. So good! We filled it with cow's milk free Manchego Cheese (a Spanish cheese, made from Sheep's milk). 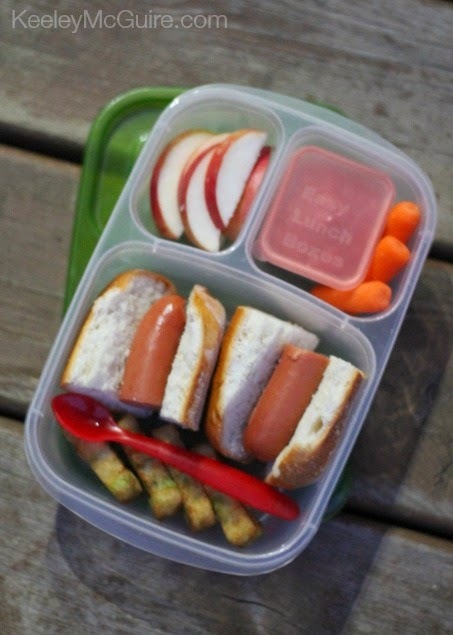 Also packed are carrot sticks and melon balls. 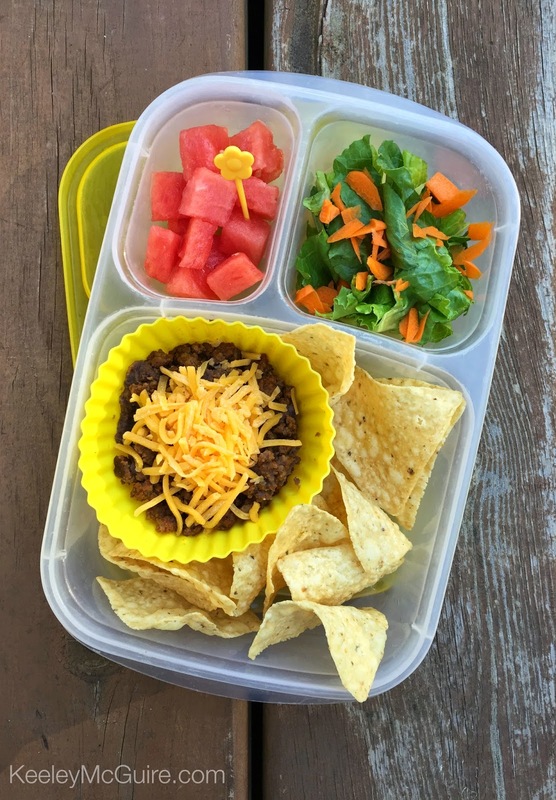 Besides pizza, one of Little Miss' favorite leftovers to have for lunch is Taco Meat! Here is put the leftover meat, along with organic refried black beans, into a silicone cup with cheese. That way she could easily reheat it at school. No access to a microwave? Pack it in a thermos instead! 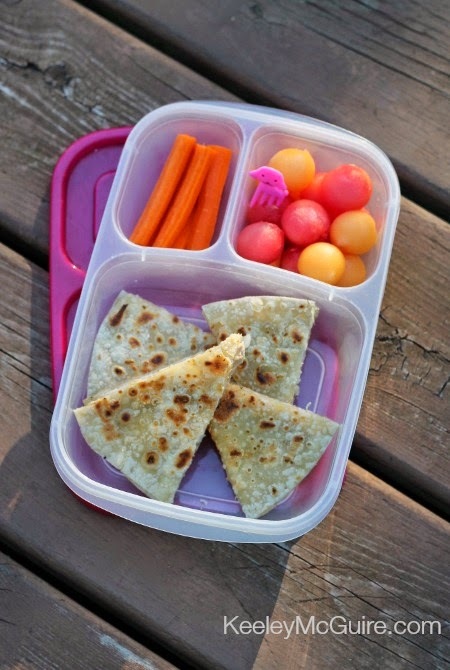 She has tortilla chips for dipping, a side salad, and watermelon dices to finish off her lunch. I wanted to do something fun but didn't have a lot of time. So I got out my mini star cutter and quickly made these mini star SunButter sandwiches on gluten free bread. Dab a little on top to make a smiling face for added fun! 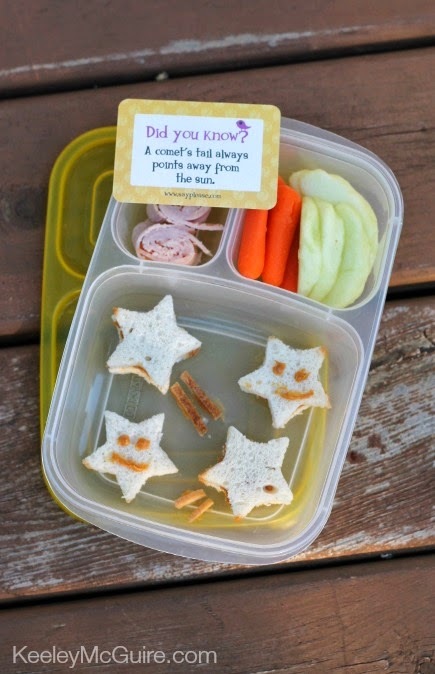 The Lunchbox Love Note card fit the sandwich theme perfectly. 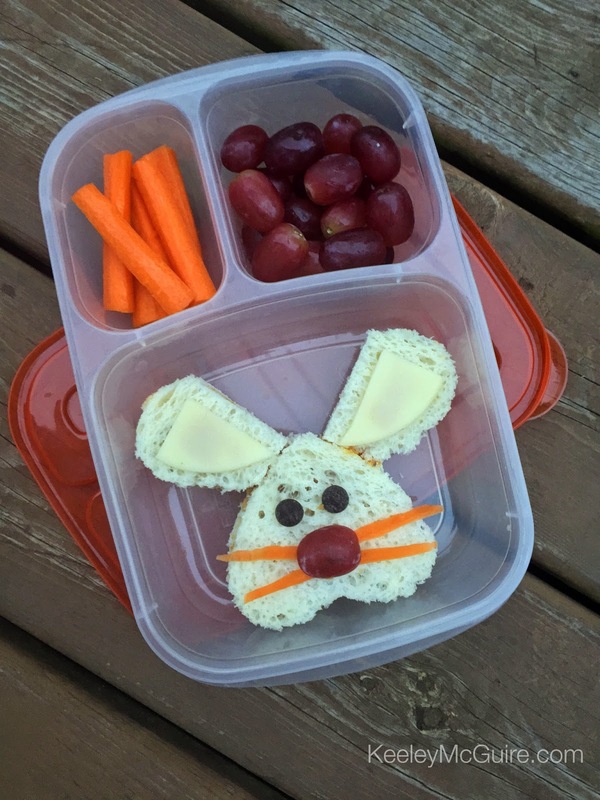 In the session, which FLEW by, we talked about picky eaters, tips & tricks, and I also showed how to create some fun sandwiches using only heart shaped cookie cutters. This bunny being one of them. :) Little Miss actually has it at school today. So simple to do. Filled with SunButter and held together with the SunButter like "glue". The eyes are Enjoy Life Dark Chocolate Morsels, grape nose, and carrot whiskers.